Last April (2016), we set out to adopt a dog. We wanted one that could hike with us, would protect us at our house and while camping, would love us, snuggle with us on the couch, and become the best family dog ever. We were not disappointed!! We found this handsome fellow through AARF here in Seattle. 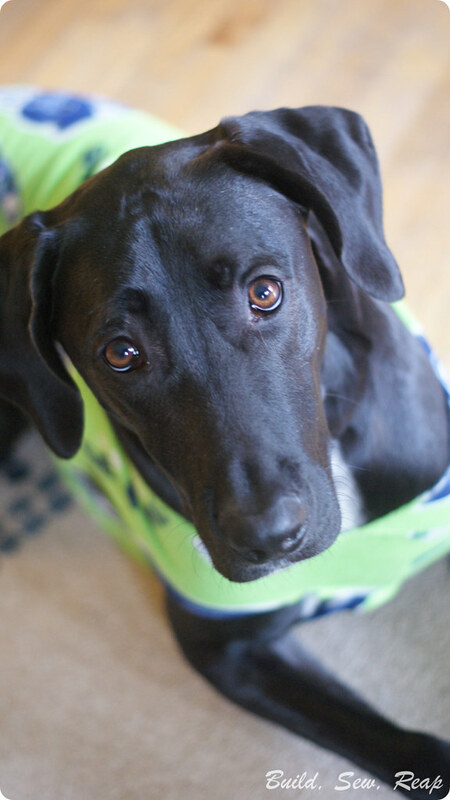 He was pulled out of a shelter in Louisiana by Louisiana Lifeline for K-9s, fostered by a family there, then transported to Seattle to live with us. Just look at that face! I took that picture earlier today. He's 1 1/2 years old now but we got him when he was about 9 months old. He was already a big guy but has finally stopped growing by leaps and bounds at around 100lbs. He thinks he's a lap dog. He barks at strangers but knows that delivery trucks and pizza are welcome arrivals. He tried to chew up lots of stuffed animals when he first came to us but seems to have learned that's not a behavior we appreciate. He's the best darn dog in the whole world. 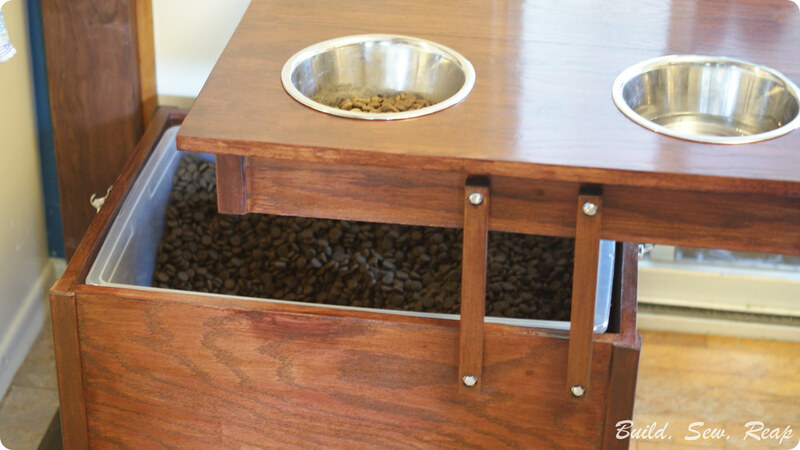 Being the best darn dog, he deserves the best possible feed station of course. 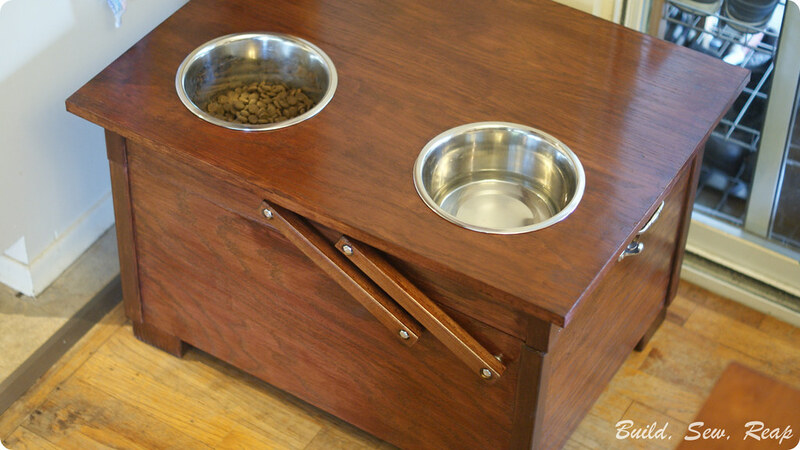 I wanted something that would look good because there's nowhere to feed him except right between the kitchen and dining areas. 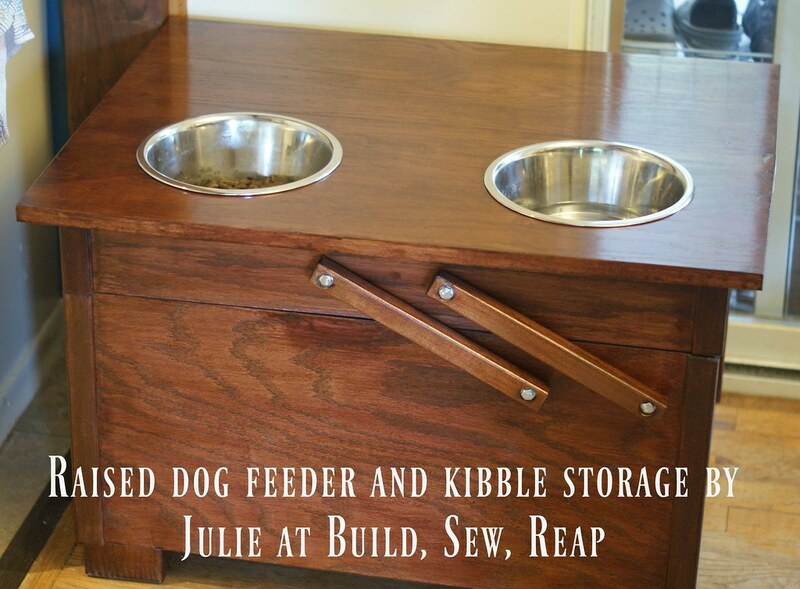 I also wanted something that would hold his kibble (a 35lb bag) and that wouldn't require any complicated instructions for opening so the kids could easily fill his bowl. Because I love a good challenge, I also tried to only use scrap wood from the garage. I had several partial pieces of 1/2 inch plywood out there so I drew out my plans based on those scrap pieces. 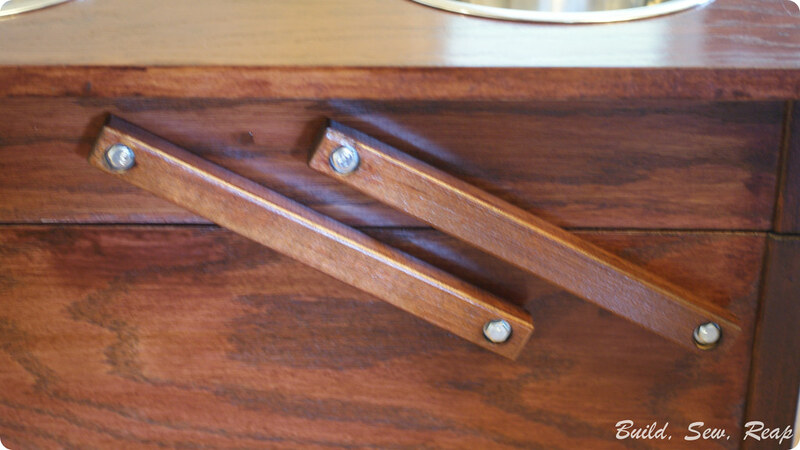 It features latches on either side to keep it locked tight. I created a cantilever hinge out of scrap wood, bolts, nuts, and washers. The other side of the box has the same two pieces. It slides open without having to remove the bowls. They always stay completely level. 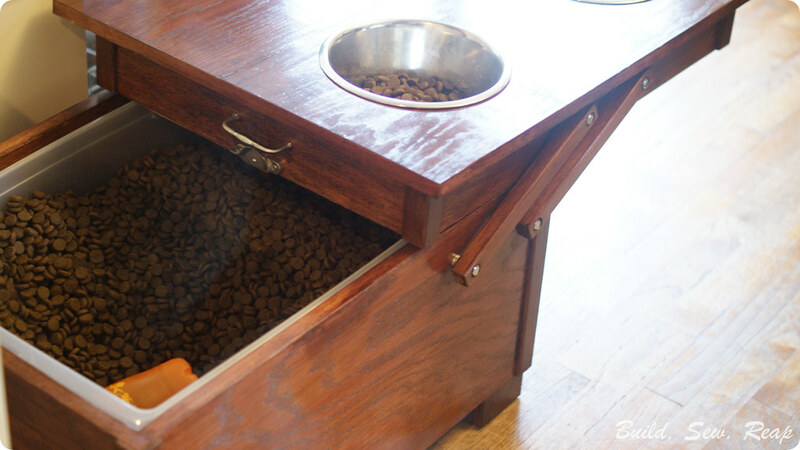 The top part can rest open for easy kibble refills. I built the box to house a plastic storage bin. Moe is confused why he got a midday snack. The life of a blogger's dog can be pretty sweet. If you have questions about this build, please feel free to leave a comment here or email me directly. I didn't stop to take a lot of pictures along the way but am hoping that by providing lots of pictures here, you might be able to create your own storage box. If you do, I'd love to see pictures! Do you have a pet cat? 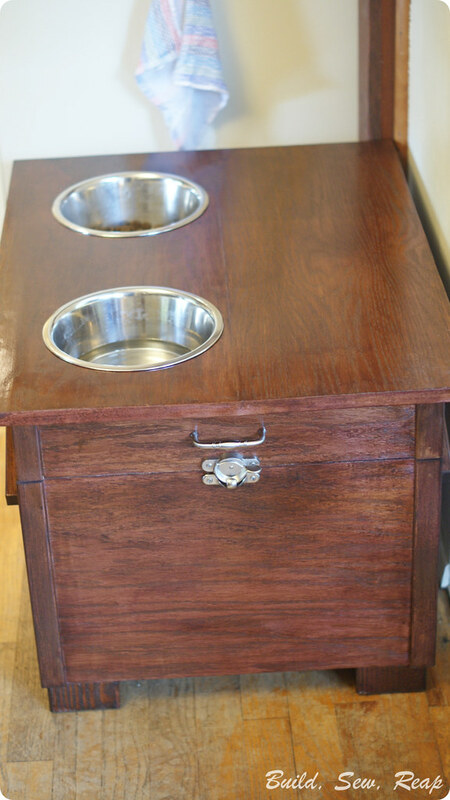 Have you worried about your pets health? First of all you have to think about that what kinds of food you were given to your cat. 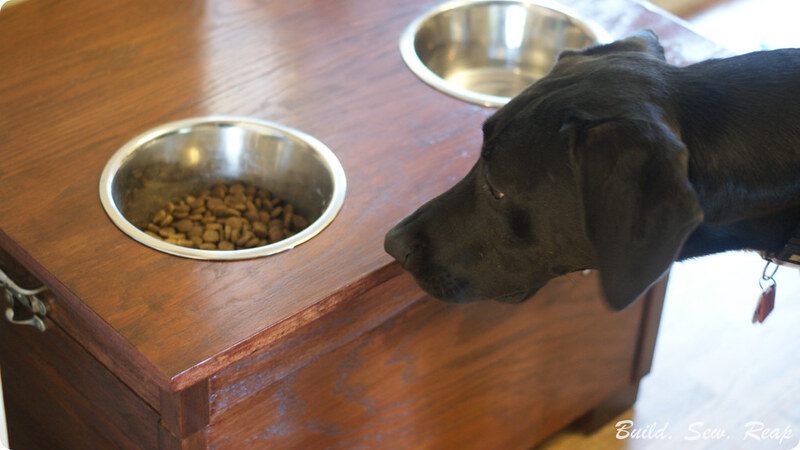 Sometimes homes made food doesn't meet the essential requirements of pet animal. We produce best wet balanced cat food with proper nutrition , vitamins and minerals that will be very beneficial for your cat. Please visit our site for more information. I don't want pet haters to call the pound every time they get woken up and toss away the pig ears for dogs. Hopefully they get it, and they should really, really try.